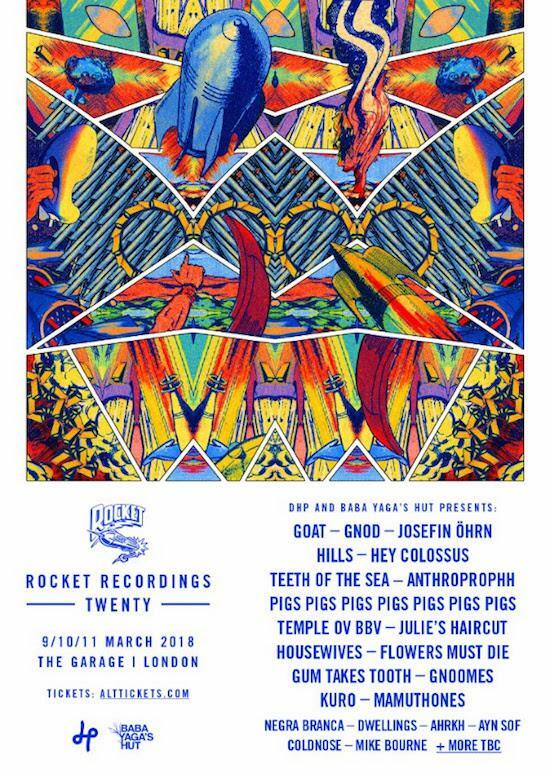 2018 will mark two whole decades of existence for one of tQ's favourite labels, Rocket Recordings. To mark the occasion, they'll be throwing a three-day bash at London's The Garage, inviting some of the label's finest talent to play across the weekend. Goat, Gnod and Josefin Öhrn lead proceedings, while the likes of Hey Colossus, Hills, Pigs Pigs Pigs Pigs Pigs Pigs Pigs, Teeth of the Sea, Anthroprophh, Temple Ov BBV, Housewives and Julie's Haircut are also billed to make an appearance. The lineup is rounded out by Gum Takes Tooth, Gnoomes, Flowers Must Die, Kuro, Mamuthones, Negra Branca, Dwellings, AHRKH, Ayn Sof, Coldnose and Mike Bourne. The label also promises that a few more DJs and live bands are set to join the billing ahead of the event. It will all take place from March 9-11, and you can find more details, as well as get tickets, here.